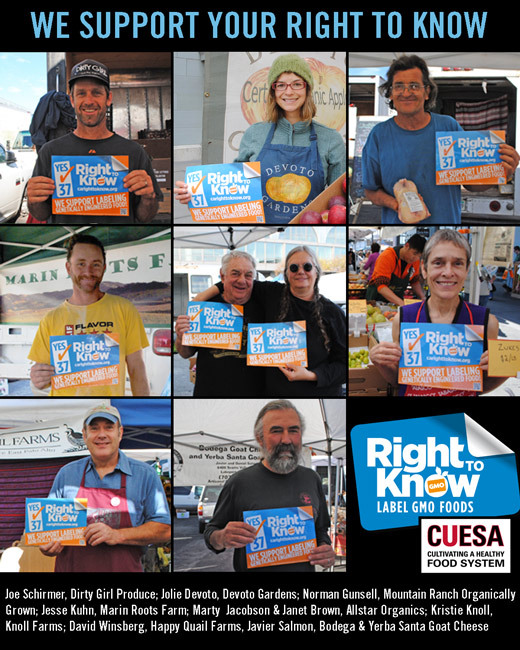 On Saturday, October 27, 2012, CUESA and Pesticide Action Network hosted a press event at the Ferry Plaza Farmers Market to introduce a coalition of conventional and organic California farmers formed to challenge a series of misleading advertisements and throw their support behind labeling of genetically engineered foods. 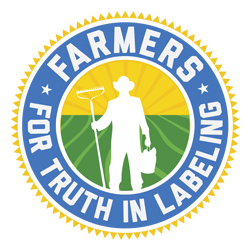 Nigel Walker of Eatwell Farm, Bryce Loewen of Blossom Bluff Orchards, David Winsberg of Happy Quail Farms, Kristie Knoll of Knoll Farms, and Janet Brown of Allstar Organics spoke out in favor of the labeling initiative, while other Ferry Plaza farmers stood with them to show their support. The event was just one of many that took place at farmers markets across the state this week, including others in Monterey, Sacramento, Fresno, and Ventura.